Welcome to the Array of Things, a networked urban sensor project that’s changing our understanding of cities and urban life. 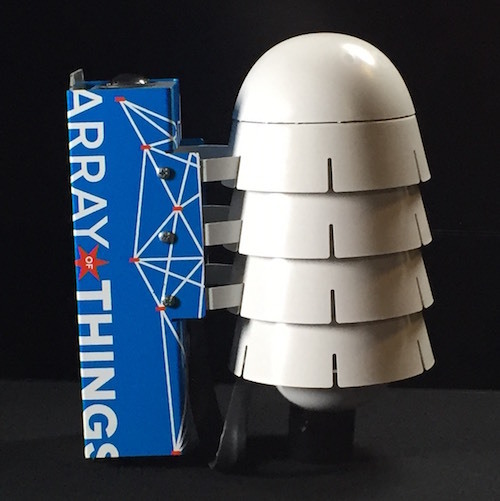 The Array of Things is a collaborative effort among leading scientists, universities, local government, and communities to collect real-time data on urban environment, infrastructure, and activity for research and public use. To learn more about the project and its updates, keep tabs on this website, check out our blog, and follow us on Twitter @arrayofthings. You can also explore Array of Things data, read about the first Array of Things nodes installed on Chicago intersections, watch our introductory video, a video and plenary panel at the 2017 annual Supercomputing conference, and read coverage of the launch from USA Today and CNN. If you have an idea for Array of Things sensors or node locations, please submit it here. For research partners who would like to get involved with Array of Things, please send us an e-mail. With a grant from Motorola Solutions Foundation, we're expanding our "Lane of Things" workshop into a broader "School of Things" curriculum that introduces high school and middle school students to sensor technology and data science. Read more on the AoT blog. 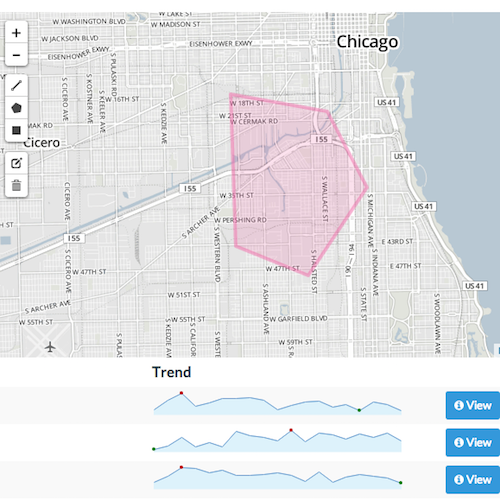 Data from Array of Things nodes is currently available as bulk downloads and via API, and will soon be available at Plenario and the City of Chicago Data Portal. Read more about the API release at the AoT blog. We're excited to announce our first group of partner projects, deployments of AoT nodes in Palo Alto, Seattle, Portland, Denver, Chapel Hill, and Syracuse in collaboration with local universities, government, and industry. You can also learn more about becoming an AoT research partner at our new Partners page. The Chicago Tribune covered our 2018 Lane of Things workshop, where high school students built and installed their own sensors to collect data on weather, sound, and fan sentiment at Wrigley Field. In May, Array of Things installed its 100th node in Chicago! Read about the first hundred nodes, the first batch of released data, and this year's Lane of Things program. What Is The Array of Things? What if a light pole told you to watch out for an icy patch of sidewalk ahead? What if an app told you the most populated route for a late-night walk to the El station by yourself? What if you could get weather and air quality information block-by-block, instead of city-by-city? 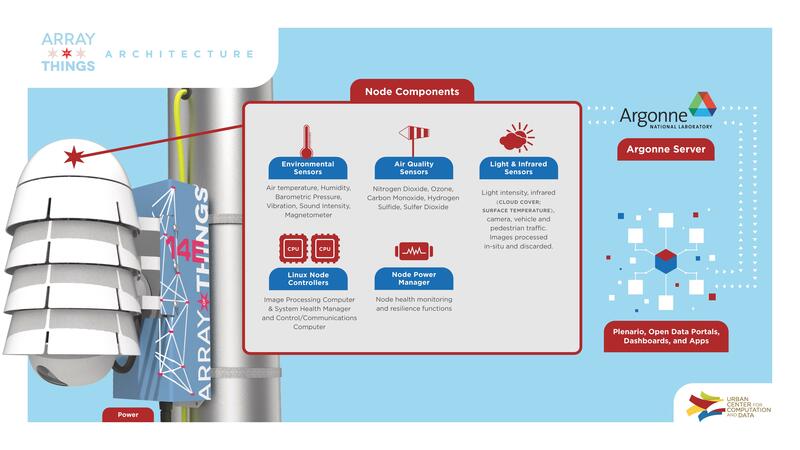 The Array of Things (AoT) is an urban sensing network of programmable, modular nodes that will be installed around cities to collect real-time data on the city’s environment, infrastructure, and activity for research and public use. AoT will essentially serve as a “fitness tracker” for the city, measuring factors that impact livability in cities such as climate, air quality and noise. Read more about Array of Things at Bloomberg View, Chicago Magazine, USA Today, the Chicago Sun-Times, and E+D Magazine, or watch a video on the project from WIRED. Array of Things was a nominee for the 2014 Cooper Hewitt People's Design Award. What is the Goal of the Array of Things? AoT will provide real-time, location-based data about urban environment, infrastructure and activity to researchers and the public. This initiative has the potential to allow researchers, policymakers, developers and residents to work together and take specific actions that will make cities healthier, more efficient and more livable. The data will help cities operate more efficiently and realize cost savings by anticipating and proactively addressing challenges such as urban flooding and traffic safety. Because the data will be published openly and without charge, it will also support the development of innovative applications, such as a mobile application that allows a resident to track their exposure to certain air contaminants, or to navigate through the city based on avoiding urban heat islands, poor air quality, or excessive noise and congestion. Array of Things also serves as the flagship deployment of an innovative new type of cyberinfrastructure -- a distributed, programmable system of nodes that can be used to answer critical research questions across different settings and fields of study. 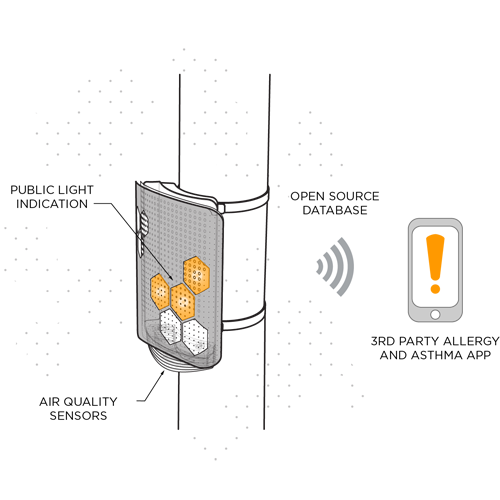 AoT is based upon Waggle technology, an open platform for edge computing and intelligent, wireless sensors developed at Argonne National Laboratory. In addition to AoT and other urban research initiatives, Waggle software and hardware supports environmental and atmospheric science in a variety of environments, from the Chicago Botanic Garden to the Atmospheric Radiation Measurement Research Facility in Oklahoma. The nodes will initially measure temperature, barometric pressure, light, vibration, carbon monoxide, nitrogen dioxide, sulfur dioxide, ozone, ambient sound intensity, and pedestrian and vehicle traffic. Continued research and development is using machine learning to create sensors to monitor other urban factors of interest such as flooding and standing water. The Array of Things project is interested in monitoring urban environment and activity, not individuals. In fact, the technology and policy have been designed to specifically minimize any potential collection of data about individuals, so privacy protection is built into the design of the sensors and into the operating policies. What Can be Done with this Data? Sensors monitoring air quality, sound and vibration (to detect heavy vehicle traffic), and temperature can be used to suggest the healthiest and unhealthiest walking times and routes through the city, or to study the relationship between diseases and the urban environment. Real-time detection of urban flooding can improve city services and infrastructure to prevent property damage and illness. Measurements of micro-climate in different areas of the city, so that residents can get up-to-date, high-resolution "block-by-block" weather and climate information. Observe which areas of the city are heavily populated by pedestrians at different times of day to suggest safe and efficient routes for walking late at night or for timing traffic lights during peak traffic hours to improve pedestrian safety and reduce congestion-related pollution. Data collected by AoT is open, free, and available to the public. The nodes transmit data to a secure central database server at Argonne National Laboratory. Data is then published openly to allow individuals, organizations, researchers, engineers and scientists to study urban environments, develop new data analysis tools and applications, and inform urban planning. In addition to local open data portals, data from all AoT deployments will be published at Plenario, a web-based portal that supports open data search, exploration, and downloading with open datasets from around the world. In addition, software, hardware, parts, and specifications will also be published as open source, to encourage participation and oversight from the developer community and public. You can view the architecture and current sensor list of the nodes here. Full specifications will be available soon at our Github page, when the initial node design is finalized. How is Privacy and Security Protected? Policy and operational activities are guided by the Array of Things Executive Oversight Committee (EOC), co-chaired by the Commissioner of the Chicago Department of Innovation and Technology (Danielle DuMerer) and the director of the Urban Center for Computation & Data (Charlie Catlett), with additional members from academia, industry, non-profits, and the community. Any changes to privacy, such as additional image processing algorithms or sensors that could potentially have privacy implications, require the approval of the City of Chicago and the AoT EOC, as outlined in the operation of Array of Things is governed by our privacy policies. The EOC draws upon external technical security and privacy expertise through the Technical Security and Privacy Group, chaired by Von Welch, director of Indiana University’s Center for Applied Cybersecurity Research. Operating as an external, independent review team, the committee will also be consulted whenever there is a request for a new kind of data to be collected. When and Where Will Nodes be Installed? 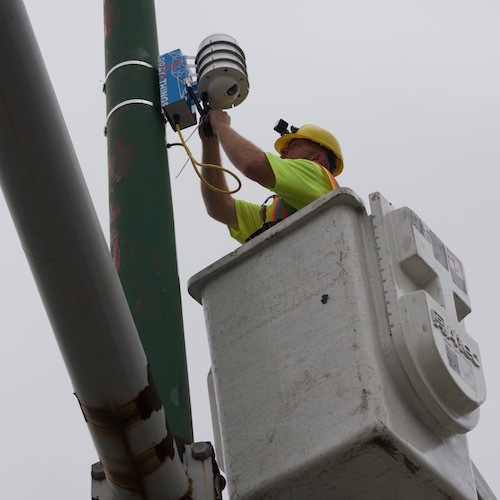 In Chicago, the Array of Things team works with several partners, including the City of Chicago’s Department of Innovation and Technology and Department of Transportation, researchers, neighborhood groups and community members, to determine the best locations for the deployment of AoT. View a map of the current and proposed node locations. 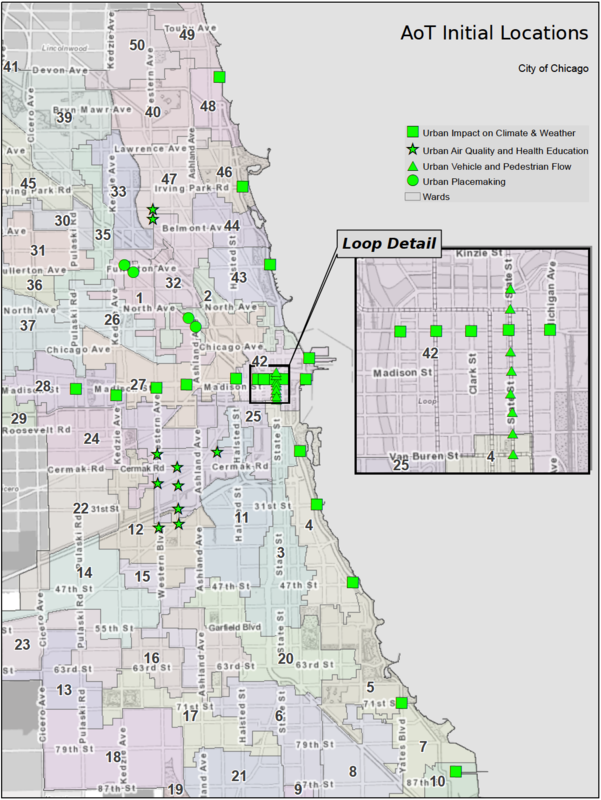 As of March 2019 there are roughly 100 nodes operating throughout Chicago, with a second 100 nodes being installed during March-June 2019. Since the project launched in 2015, we've heard from over one hundred cities interested in their own local deployment of Array of Things technology, and started several partner projects in cities such as Palo Alto, Seattle, Portland, Denver, Chapel Hill, and Syracuse. If you are a city government or academic research group interested in partnership, you can find more information here. Who is the Array of Things Team? 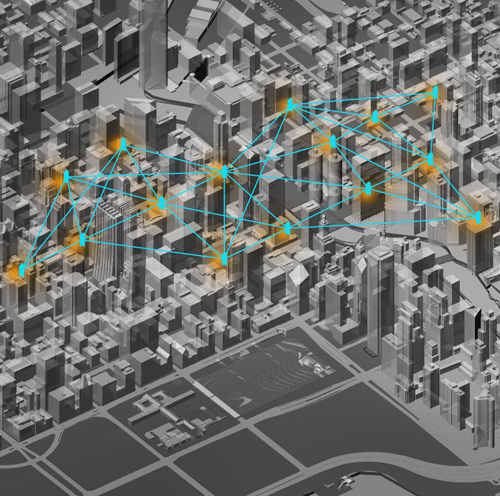 The Array of Things project is led by Charlie Catlett and researchers from the Urban Center for Computation and Data, a joint initiative of Argonne National Laboratory and the University of Chicago. The underlying open software and hardware platform, known as Waggle, was developed at Argonne National Laboratory by Pete Beckman, Rajesh Sankaran, and Charlie Catlett. The custom enclosure for the sensor nodes was developed by Product Development Technologies, based on early designs from Douglas Pancoast and Satya Mark Basu of the School of the Art Institute of Chicago. The project is executed in partnership with the City of Chicago. The Array of Things project has been guided by a series of scientific collaborations and workshops beginning in 2013, with participation from scientists at academic institutions including Northern Illinois University, University of Illinois at Chicago, University of Illinois at Urbana-Champaign, DePaul University, Illinois Institute of Technology, Purdue University, University of Notre Dame, Arizona State University, the Santa Fe Institute, University College London, Clemson University, and the Institute for Advanced Architecture of Catalonia. 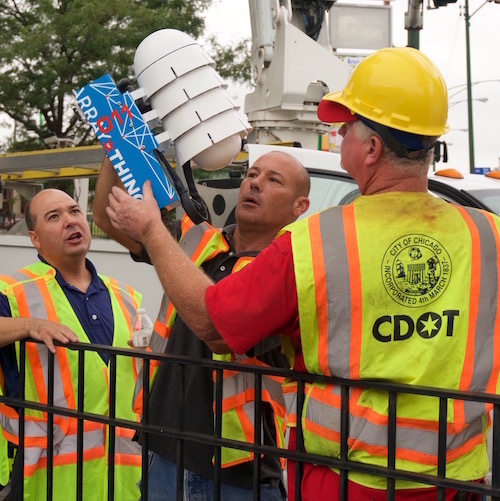 AT&T is the project’s communications partner, providing all AoT connectivity for Chicago. Technical advice and support comes from a growing number of industry partners including Cisco, Microsoft, Schneider Electric, Intel, Motorola Solutions, and Zebra Technologies. Array of Things is funded by the National Science Foundation, the Chicago Innovation Fund, the University of Chicago, and Argonne National Laboratory. Contact us at aot@uchicago.edu and follow us on Twitter @arrayofthings and Facebook.